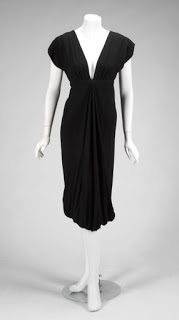 Lot Description: A black crepe cocktail dress with deep v-neck and low cut back, with pouf hemline. Interior label reads “front” to identify the front of the dress. 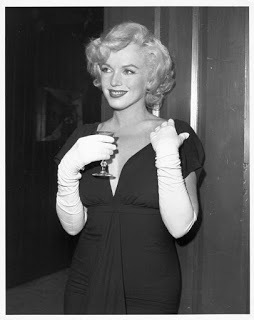 Monroe wore this dress to a 1958 party at The Beverly Hills Hotel and is pictured on the cover of the book Marilyn Monroe: From Beginning to End by Michael Ventura. No size present. Incredibly, the original sale price for this dress in 1999 was $23,000. The 1999 pre-sale estimate was $10,000 to $15,000. There were also other items of note. A two-piece Pucci ensemble sold for $48,000. The pre-sale auction estimate was $6,000 to $8,000. While only a fraction of the cost of the cocktail dress, this is an astounding amount of money for a Marilyn Monroe outfit considering there is no known photograph of Marilyn wearing the ensemble. Even more astounding, I saw this two-piece Pucci outfit sell at auction several years ago for a mere $800. Finally, this Pucci outfit was formerly owned by Robert Otto, and was one of the few authentic Marilyn Monroe owned items displayed on the Queen Mary as part of the now infamous Monroe exhibit in 2006. 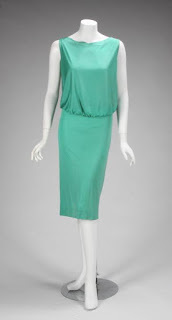 Lot Description: A two-piece silk jersey in seafoam green, boatneck, sleeveless shirt with elastic waist together with matching knee-length skirt. Each of the pieces have both Emilio Pucci and Saks Fifth Avenue labels. This Pucci outfit sold originally at the 1999 sale for $9,775. 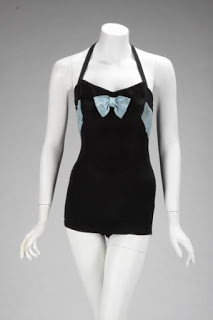 Finally, a swimsuit with a Marilyn Monroe label from an unknown MGM film sold for an astonishing $84,000. Again, an astounding sum of money considering there are no known photos of Marilyn wearing this item. The original estimate was $6,000.00 to $8,000.00. Lot Description: A Marilyn Monroe costume swimsuit from an unknown production. Swimsuit is dark blue with light blue ribbon across bust. Metro-Goldwyn-Mayer tag reads “M. Monroe 36,” additionally stamped MGM under bust lining. MMC: “What was the draw to the itmes that sold for so much beyond the estimate; The swimsuit, the Pucci ensemble, and the black cocktail dress? Darren Julien Response: “I was shocked by all of them. Even her books that sold several years ago for $500 to $800 went for $3,000 to $5,000 yesterday. It just goes to show you that everyone loves Marilyn Monroe. There are a few other auctions this summer with Marilyn Monroe items up for grabs, most significantly the Debbie Reynolds film costume collection auction next month. Marilyn Monroe has always been one of the most famous women in the world, with Monroe collectibles often selling for prices far greater than estimates. The Jean Luis dress Marilyn wore when she sang “Happy Birthday” to President John F. Kennedy in 1962 still holds the record for the most expensive dress ever sold at auction. This might be the most important auction year since 1999, determining just how much money fans, collectors, and now investors, will spend to personally own a piece of her magic. If yesterday’s auction at Julien’s was any indication, we’ll likely see more Monroe pieces reach new heights.